Die erste Ausgabe des Sun Fast World Cup endet mit einem Erfolg. Launch of the 1st #SunFastWorldCup! STECHEN SIE NOCH IN DIESEM FRÜHJAHR IN SEE - DANK UNSERER JUST-IN-TIME-ANGEBOTE! NEHMEN SIE AM SUN FAST WORLD CUP TEIL, EINER EXKLUSIVEN SUN-FAST-REGATTA, VON 5. BIS 7. APRIL 2019! Cap Camarat 7.5 BR zum Boot des Jahres gewählt! NC 33, Cap Camarat 9.0 CC und 9.0 WA sind in der Endausscheidung für die Best Of Boats Awards 2018! CRUISE WITH CONFIDENCE ABOARD JEANNEAU ! A sea full of news and events! September with Jeanneau! DIE NEUHEITEN BEI SEGEL- UND MOTORBOOTEN 2019! Course Croisière EDHEC: Herausforderung gemeistert! Sun Odyssey 440 - Neue 360°-tour! Leader 33 - Neue 360°-tour! Sun Odyssey 490 - Neue 360°-tour! Neue Auszeichnung für die Leader 33! NC 33 - New photos and new 360° view! 4.Ausgabe der Eignertreffen in China: Ein Treffen des Teilens der gemeinsamen Leidenschaft für das Segeln! Die Cap Camarat 10.5 WA wurde in der Kategorie „Day Cruiser“ zum Motorboot des Jahres 2016 gewählt! Die Sun Fast 3600 wurde zum IRC-Boot des Jahres 2016 gewählt! Merry Fisher 795 Marlin, Leader 46 und Cap Camarat 10.5WA sind in der Endausscheidung für die Best Of Boats Awards 2016! Die Leader 30 wird in der Kategorie der 30-Füßer als „Barca Dell’Anno“ ausgezeichnet! The Love Boat #15: Ein fabelhaftes Reisejahr geht zu Ende! Ein Kap-Horn-Segler an Bord eines Sun-Fizz-Bootes von Jeanneau! SIEG EINER SUN FAST 3200 BEIM BREWIN DOLPHIN COMMODORES' CUP 2016! The Love Boat 14: Ein Aufenthalt auf den Azoren. Die Rückkehr rückt näher! Eine SUN FAST 3200 erringt bei der Regatta SORC Round the Rock 2016 den dritten Podiumsplatz! SORC Round the Rock: 13 SUN FAST am Start! Two Prestigious Awards for JEANNEAU in the Asia-Pacific Region! Exclusive sea trial days in Cannes : Thank you! Die Jeanneau 54 wurde in Kroatien zum Boot des Jahres 2016 in der Kategorie der Segelboote über 36 Fuß gekürt! The Leader 46 rewarded by the Nautic Design Awards 2015! Congratulations to the Winners of the 2015 SUN FAST Challenge! Die Cap Camarat 7.5 WA Série 2 wurde in der Kategorie „Day Cruiser“ zum Motorboot des Jahres 2015 gewählt! The Leader 36 has won Best Of Boat 2015 in the category, “Best for Family! Eine äußerst spannende 4. Etappe der China Sailing Tour ging damit zu Ende! Third Leg of the China Sailing Tour! Second leg of the China Sailing Tour ! Soon the start of the China Sailing Tour ! Discover the bright, all-new interior design of the Jeanneau 57! A promising first outing for Captain Nason’s 3200 Team! Dreifache Auszeichnung für die Sun Odyssey 349! Two Jeanneau have been nominated for the 2015 Motor Boat Awards! Discover the Jeanneau ranges exhibited on the Paris Boat Show! Video - Aboard Sun Fast 3600 Invictus ! Sun Fast 3200: IRC boat of the year 2014! The Sun Fast 3600, “Kraken,” is competing in the Newcastle Bass Island Yacht Race! Video - 21 knot surf aboard the Sun Fast 3600! Podium 100% Sun Fast 3200! Sun Fast 3200 named "Best Sailing Yacht"
Sun Fast 3600 wins 2014 Spring Series! Sun Fast 3600 finishes first! Sun Fast 3200 Yolo crosses the line in Rio! Discover the Jeanneau ranges at the upcoming boatshows! The NC 14, Winner of the “Nautic Motor Boat Design Award” at the Paris Boat Show! Discover the new interiors of the Sun Odyssey DS! Jeanneau at the Cannes Boat Show ! Six Australian premières at the Sydney Boat show ! François Gabart wins the Tour of Mauritius on a Sun Fast 3200! A winning weekend for the Sun Fast 3200: 3 races, 3 podiums! The "apartment on the water with terrace and sea view" on video ! Sun Fast Success at the Spi-Ouest France ! Sun Fast 3600 : Designed for success! The Velasco 43 and the NC14 are up for the Design Award for powerboats! Sun Odyssey 439 goes game fishing! Take advantage of the new limited edition ! 2 nominations for the European Powerboat of the Year award for 2013. Sun Odyssey 509 : "Born to run"
Cap Camarat Rally - 323 nautical miles in the Mediterranean. Challenge met! The Cap Star Quiz ! 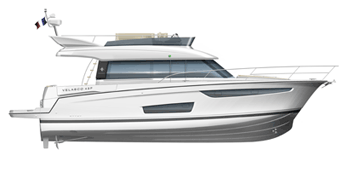 In 2012, the Cap Camarat line by Jeanneau celebrates its 30-year anniversary. With an attractive design, the Sun Odyssey 44i is pure sailing pleasure. The Youtube Jeanneau channel's has changed ! COME AND TEST SAIL THE CAP CAMARAT OF YOUR CHOICE! Jeanneau to take part in Rio Boat Show ! Limited Editions Azur, Horizon, Commodore & Style continue. The new Jeanneau Sun Odyssey 409 faces a stiff test ! Düsseldorf boat show, 2 Jeanneau boats nominated "European Yacht / Powerboat of the year 2012"
Entdecken Sie die offizielle Jeanneau Boutique! Jeanneau NC11: To know it is to love it! Mateusz' report "100 years of the Star Class"
Nomination of the Merry Fisher 855 ! "European Powerboat of the Year 2012"
Jeanneau launches the countdown to summer ! First issue of the Jeanneau "News Magazine"
Kaufen Sie Ihre Sun Fast 3200 Offshore zum Vorzugspreis! Sondermodell Sun Odyssey 33i Commodore: schnell zugreifen! Herzlich willkommen in der Rubrik My Jeanneau. Discover the pictures of JEANNEAU and PRESTIGE events of PARIS boat show Pictures of official presentation of boats in PARIS boat show ! Limited edition PRESTIGE "DIAMOND EDITION"
For the London Boat Show, request your free passes now! The Cap Camarat 7.5 CC in world premiere in Barcelona Come quickly to discover the 7.5 CC ! Chance Nr. 1: Sonderangebote bei Ihrem Händler! Sun Odyssey 409 – umwerfend schön! Jeanneau stellt vor: das 360° Docking-System ! French races : Solo Atlantique 2009, balade Irland and Celtikup. SUN FAST 3200 : discover the article published in the US magazine "Sailingmagazine"
TRANSQUADRA: the first ones unless 200 miles of the finishing line! Take a Tour of the Sun Fast 3200 with Jeanneau's Paul Fenn and Harken's Tim Kent. Congratulations 14 Sun Fast 3200 for Transquadra. Azul comércio de produtos náuticos Ltda. JUST PERFECT Y.C. / JP STORITVE D.O.O. Motor Boat and Sail s.r.l. PRESTIGE MARINE (Shenzhen) Co., Ltd.
Riverside Marina & Yacht Sales, LLC. TILTANIT Consulting, Services and Investments LTD.
TOP LEISURE YAT SATIS VE SERVIS A.S.